We welcomed back to WSHU The Shamrogues, the loose collective of Celtic musicians and vocalists who gather weekly at the nearby Gaelic-American Club in Fairfield. 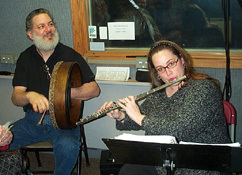 They were 11 strong on this, their second visit to Profiles in Folk, where they made their radio debut on Feb. 28, 2003. The Shamrogues are not only gifted musicians (who can be hired to perform at everything from house parties to concerts), but they also run the Shamrock Traditional Irish Music Association, which for more than five years has been bringing some the leading traditional Celtic players in the world to this region to perform in concert. We spent the entire two hours with The Shamrogues. It was a wild hail and hearty ride and for the last several numbers featured soloists with the group. We also played selections from a new CD, “Our Music To You/Volume 1,” which the group has compiled mainly from live recordings of the aforementioned concert series. And, of course, there was a great mix of sound by WSHU Chief Engineer Paul Litwinovich. 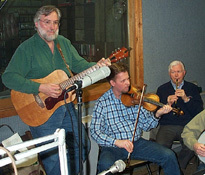 The SHAMROGUES joined Steve Winters on February 6th for an evening of great Celtic music on a Live In Studio A edition of Profiles In Folk. The Shamrogues joining us in the studio were Tim Quinn, Gregg Burnett, Molly Wilson, Tom Gallagher, Don Cavett (a founder), Don Moran (also a founder), Pat Mooney, Loretta Murphy, Andrew Carey, Stu Speir and Elaine Carroll.